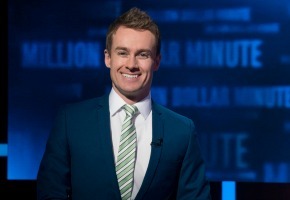 Seven has now confirmed Million Dollar Minute will launch at 5:30pm next Monday. Deal or No Deal is finally being moved to 5pm, after a stellar run as the lead-in to Seven News. As previously tipped, Seven News at 4 will now run for 1 hour rather than 90 minutes. The risk for Seven in moving Deal or No Deal is huge, particularly if Million Dollar Minute does not fire. But Seven had to act to address its News lead-in. Deal is likely to play out until the rest of the year, but it isn’t clear if it will ever resume production. I usually watch 5pm news on ten until the sport comes on, then switch over to the Deal. Might give MDM a go just to see what it’s like. Look, I can’t see this working at all. The previews Seven showed were dreadful! The set looked cold and dark, the lighting was terrible, the presentation of the questions was tedious and confusing with the A, B, C, D options and the presenter was boring. Also, the questions seemed to have been recycled from Eddie’s show – eg: “How many kangaroos are there on the $1.00 coin?”. That question has been used on Hot Seat at least three times. Was thinking of giving this a crack…then I saw Grant Denyer was involved…I’m out! If this fails i might never have to see that annoying person on my screen every again. Here’s hoping. Thanks for the WA news info David. I prefer having the news at 4:30pm. They will keep Deal going until they are sure MDM is better. If it isn’t Deal will move back to 5:30pm and they will try again. I believe DOND’s move to 5pm will only be temporary. I believe that later this year or early next it will be gone. It sounds too “Millionaire Hotseat” not sure it will fire, if it does Hotseat will likely be affected. Love Deal or no Deal. I could watch AOK all day. Good luck Grant and hope it all works out. I saw huge billboards in my local shopping centre yesterday for this. Up until yesterday, I thought it was going to be a primetime offering. And you’re right David, Deal or no Deal has had an incredible run. Combined with Seven News and Today Tonight, it pioneered Seven to be a ratings powerhouse. That said, I wish Grant the very best of luck. Being tasked with this responsibility would unsettle me.